Please note: this article contains spoilers of the contents. Don't read this review if you plan on buying this product. Living in Germany, there are a lot of choices when it comes to Advent calendars. Of course, there are lots of styles of chocolate calendars, but also calendars with beer, tea, Lego, and even a 'couples' calendar from the local drug store. 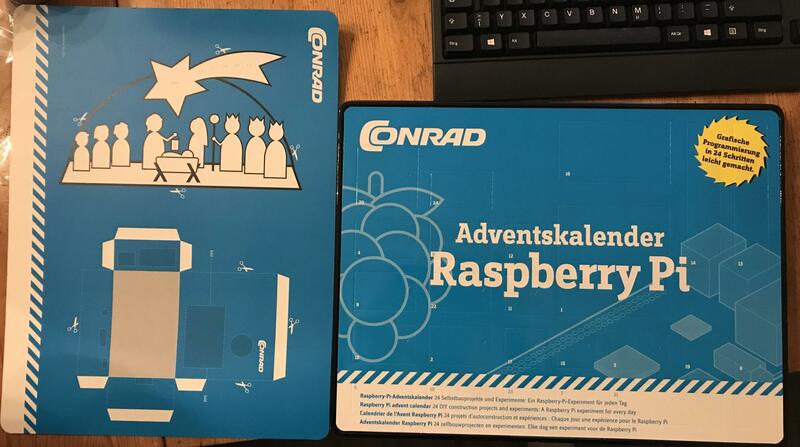 One of the more interesting themes was a Raspberry Pi Advent calendar from Conrad. Conrad is a chain of electronic stores in Germany that sell a lot of classic electronic bits. All the small things you typically associate with electronics: resistors, buttons, etc. They also have a decent selection of Raspberry Pi products, one of them being an Advent calendar. Naturally I couldn't resist and decided to get one for the holidays. So what do you get for your 29EUR? Well, there isn't much to say about the presentation of the box itself. It looks like a typical calendar with 24 doors, one for each day in December leading up to Christmas. They're all well separated into small compartments so you won't see anything from other doors while opening each one. You also get a large cardboard nativity-scene cutout so you can probably guess what final project will look like. It's also worth noting that it doesn't contain the Raspberry Pi itself so you will need to supply your own Pi as well as a keyboard, mouse, and screen. Each little door contains a few electronic bits that you will use the day's project. The variety in parts is pretty limited and most days there won't be anything except cables. I think the last 4-5 days opening doors was nothing but cables which was really disappointing. Even the larger doors that allude to something more interesting just contain cables. This was probably the biggest disappointment of the calendar. That said, there were some slightly more interesting pieces like a couple of tri-color LEDs that get used for some neat effects. 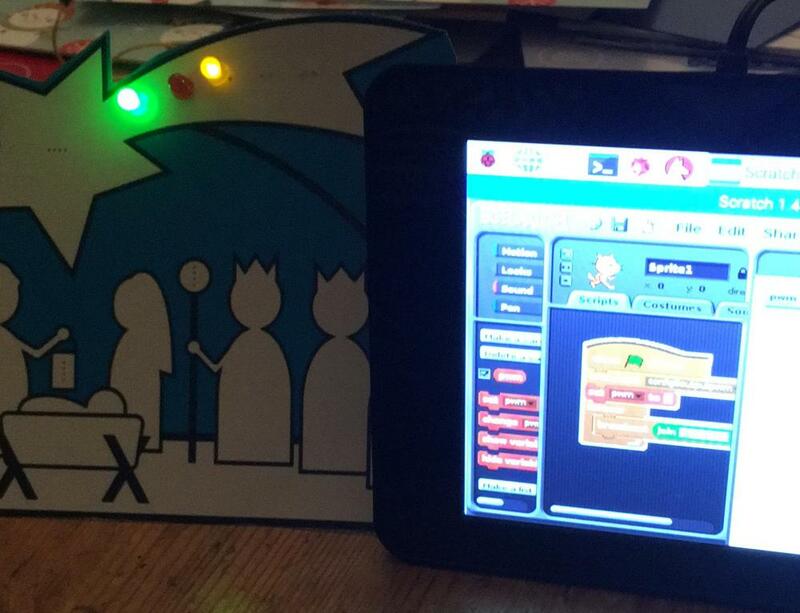 The programming is all done using a visual language called Scratch. You can build simple programs using basic visual blocks that represent things like loops and if-else statements. For basic things it works alright but programs can quickly grow very large and they become difficult to work with. By the end of the calendar the programs were so large that my wife and I stopped doing everything ourselves and just used the pre-made ones. The included instructions are only in German but several other languages are available online. Beware, the English instructions are badly Google translated. My wife and I had to refer to the German instructions several times to clear things up. Annoyingly, all versions of the instructions contained some very obvious mistakes. On one day the project diagram showed all wires going to ground. If this is somebody's first experience with electronics then stupid mistakes like this can be really frustrating. I would stay far and clear from this calendar in the future. There are just too many negatives between the instructions contained mistakes, the programming language being difficult to work with, and the disappointing amount of components.